The action flick starring Dwayne Johnson will be unleashed on 4K Blu-ray later this year. 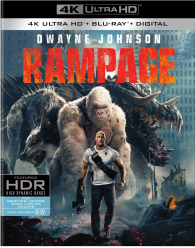 In an early announcement to retailers, Warner Bros. is prepping Rampage for 4K Ultra HD Blu-ray, Blu-ray, and Blu-ray 3D. All three home video releases will be available in stores on July 17, with digital downloads available on June 26. - Not A Game Anymore - From arcade sensation to movie monster epic, we explore how the Midway video game inspired the filmmakers to create the ultimate disaster film. - Gag Reel - Hilarious outtakes and mishaps captured during production. - Deleted Scenes - Deleted scenes that barely missed the final theatrical cut. 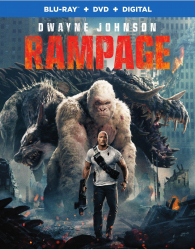 - Rampage - Actors in Action: Strap in for a wild ride as Dwayne Johnson, Joe Manganiello and the cast prepare for the film’s demanding stunts and explosive set pieces. - Trio of Destruction - Follow the innovative design team and the artists at Weta Digital as they bring to life the biggest and baddest monsters for the film’s climactic battle royal. - Attack on Chicago - Director Brad Peyton reveals the challenges of filming on-location in Chicago and turning digital destruction into a cinematic reality. - Bringing George to Life - Discover the wonder of what it’s like to be a gorilla, as movement coordinator Terry Notary teaches actor Jason Liles how to move, behave and become “George." 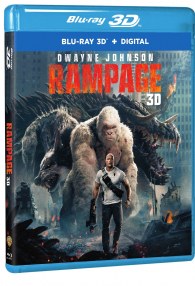 You can find the latest specs for Rampage linked from our Blu-ray and 4K Release Schedules, where it is indexed under July 17.